A man has been trampled to death by a herd of cows while out walking his dog. The body of a 67-year-old man and his pet dog were discovered in a field on Monday in Forest Row, East Sussex, but details are only now emerging. The cause of both deaths is yet to be officially confirmed, but it is believed that they were trampled by a herd on the farmland. Police said they are not treating the deaths as suspicious. Although a coroner will hold an inquest to investigate the tragic circumstances, at this stage it looks as though the man and his dog were likely trampled by cattle in the rural county. A spokeswoman for Sussex Police said: “The bodies of a man and a dog were found in a field on farmland in Priory Row, Forest Row, at 1.45pm on Monday, October 8. The deaths come two months after 64-year-old Stephen Sandy was trampled to death by his cattle just 15 minutes drive away in Groombridge. Government statistics show that nearly 80 people have died in accidents involving cattle since 2000 – about four a year. The majority of victims are farm workers but a quarter are unsuspecting members of the public out walking on footpaths. Natural behaviour of cattle if felt threatened , no longer a farmer but you try and explain mainly too ‘ townies ‘ who believe they can let their dogs loose on any land . If they take the dogs on the pavements and they mess and they are caught there is a penalty , on someone’s lawn in an open plan estate where you are not allowed fencing you have no protection . Two dogs being hunted by the police for savaging a child they say they must be put down. These cows have killed a human will they be put down? 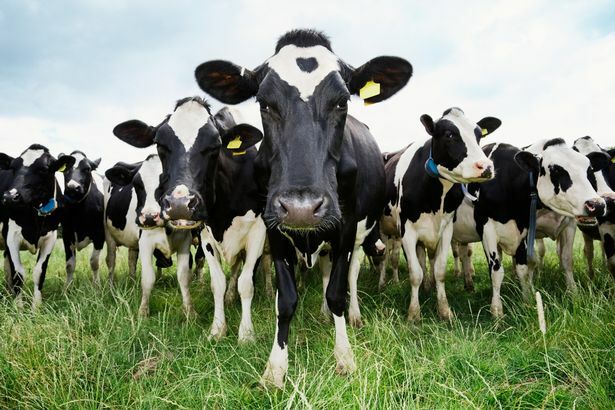 so more deaths from cattle than smoking cannabis – time we had a war on cows!! !